Lyra, with bright Vega, is centered in the picturei, its distinctive parallogram dropping down and to the left. Cygnus runs across the bottom, Delta Cygni to the left, Albireo (Beta Cyg) to the right. Draco lies to the upper left corner with two of its brigher stars, Rastaban (Beta Dra) near the corner, Eltanin (Gamma Dra) down and to the right of it. 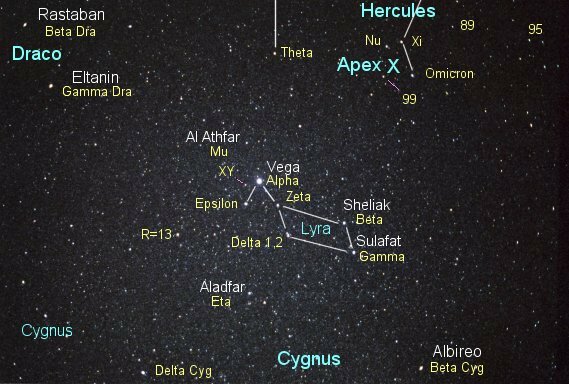 The stars of eastern Hercules wrap around above and to the right of Lyra. The "Apex of the Sun's Way," the "standard solar motion, the direction in which the Sun is moving relative to the brighter neighboring stars, lies close to Xi and Omicron Herculis, and is labelled with a blue "X." The "basic solar motion," the movement of the Sun relative to the known stars within 325 or so light years, is nicely marked by 89 Herculis.